Our soon-to-be 4 year old is very much fascinated with dinosaurs! "Roarrrr! Groooowl! Mommy, I'm a dinosaur! I'm a carnivore, I only eat chicken (and maling, too)!" He's a big dinosaur fan. He knows dinosaur names from A to Z! He was so happy when we bought a dinosaur egg. He couldn't wait for it to hatch! Akala nya siguro lalaki talaga. He was a wee bit disappointed when it did not grow as big as he imagined. His daddy also bought him 4m Glow in the dark mould and paint dinosaur in toy kingdom. He kept bugging his daddy to make the dinosaurs until his daddy reluctantly gave in. Ang kulit lang talaga! He could hardly wait for the mold to set in. Akyat-baba sa hagdan at panay ang tanong kung okay na daw ba. Umeskapo na ang daddy! So I was left with the daunting task of painting the dinosaur. I managed to paint one before I feigned fatigue and sleepiness. It's been a while since I saw a view as breathtaking and raw as that of the Blue Lagoon in Bucas Grande Island in Surigao del Norte. Stunning! As in wow talaga! I felt so close to our Creator and the grandeur of His creations. Forgive the resolution of the pictures. We only used our phone cameras. Husband and I booked a trip to Club Tara Resort last November 2012 and it proved to be one of our most memorable yet. I got the deal through cashcash pinoy. We stayed for 2 nights. This post is long overdue but I wanted to write about our unforgettable trip before I forget the details. Hehehe. My memory is becoming so unreliable. From Surigao airport, the hotel van service picked us up. It took 1 hour and 30 minutes to get to the pier and 30 minutes from the pier to the island. It cost us P6,000 good for 2 persons when we availed of the hotel transfers. Very convenient but a bit expensive compared to haggling with the van and banca drivers. We're done with TL#2's 1st birthday party. Whew! TL#1 enjoyed the party so much and was so tired that he slept until 9 am on Sunday. We hope the guests, especially the kids had a great time too. This morning, I had TL#2's cupcake for breakfast paired with nestle hot chocolate. The chocolate cake was moist, yummy and not too sweet. Nice way to start my day! Since I did not include backdrops in the budget for the party, the cake and the cupcakes were the centerpiece and the only thing that points out the theme for the party - baby tv characters. They were beautifully made by Emily Uy- Swing of Sugarbox. There's a lot of cake suppliers online that I did not know who to contact at first. A friend referred Sugarbox. In a meeting with our bosses and fellow managers, I found myself a bit out of place. My colleagues seem to be talking a foreign language. They were into initiatives, growth, marketing. 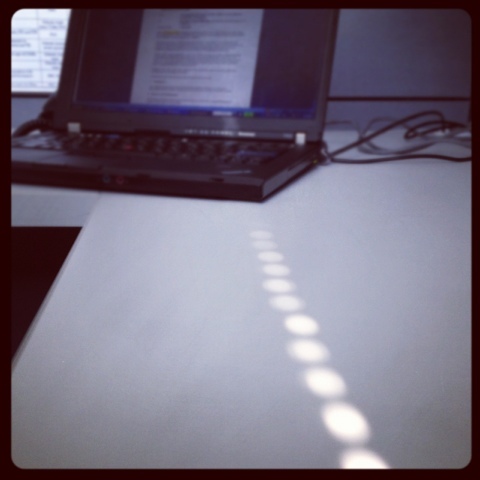 In my mind, I can only see myself on my desk busy reviewing deliverables, answering queries, making proposals. But to go beyond that, I feel some reluctance and a lot of pain. This grown up has some serious growing up to do! But how? Should I spend less time reading my magazine subscriptions (Yes!, Star, OK) and browsing pep.ph? Aside from spending time with my hubby and kids, updating my blog and watching the Voice! Philippines, I do nothing else but sleep and eat. My hands are full as it is. And yet there is still some growing up to do? I'm clueless where to start and I'm a bit inflexible because of my age. But am I at least asking the right questions? Be a Unicef Champion for Children. I have become one only recently. I was in Powerbooks Greenbelt, looking for some school supplies for TL#1 when someone approached me. I am normally wary of salespeople and say no right away. But the UNICEF fundraiser's come on was, I'm sure you do not have kids yet. And I was (ahem) flattered and said I already have two kids. That was the start and soon he had me convinced to sign up as a champion. Beforehand, I was aware of the program because the husband receives mail from UNICEF regularly. UNICEF is an agency of the United Nations committed in helping the world's poorest children. Champions for Children is a community of individuals whose regular monthly contributions help the poorest, most vulnerable children to enjoy the right to education, healthcare and nutrition as well as protection from violence, abuse and exploitation. A week ago, I woke up on the wrong side of the bed. It has not gotten any better since. My behavior today before I left home for work was inexcusable. Matinding matandang tantrums! My patience has run out. I am at my boiling point. I snap at anything and anyone, most of all at my husband and TL#1. What's frustrating me? Well, among others, TL#2's ever-reliable yaya is leaving and we have not found a replacement, even an unsuitable one. My denim pants won't fit. Daym! Oh I forgot, I have a client meeting, can't dress down. I can't find my ID! TL#1 won't stop whining and he's late for school. Shut up please! I have not even combed my hair yet. Nasaan ba ang mga suklay dito?!? Hay naku, pudpod na ang sapatos ko! My husband is still in bed playing Clash of Titans and I am envious. Sabay lang naman kami uuwi! Today is TL#2's birthday so hubby and I took the day off. To maximize the day, we decided to spend the morning eating a frog in the Land Transportation Office (LTO) - me, for the renewal of my expired driver's license which i've been putting off for more than a year now. I do not really drive so there was no point until recently. I will turn 32 in August and there's no harm (really?) to try to muster the courage to drive live with all the other drivers out there. Scary! We arrived here in LTO - FTI Taguig at 9:15 am. The queue is organized and the officers are helpful. There are also documentation requirements and steps posted in conspicuous places. Fo renewal, you only need your driver's license and accomplished application form plus medical certificate. There was no need for a drug test due to the recent lifting of such requirement by Senate Bill 45 filed by Sen. Tito Sotto. Pwedeng umiyak? Gutom na yata ako. My head is aching. Maybe I talked too much in the meeting. Mondays are really manic. As soon as I tick off a to do, another one crops up. Mushroom?!? I've been toting this book The One-Life Solution by Dr. Henry Cloud for about two months now. I have yet to turn another page since I got stuck on p.66 (of p.239). The byline promise is - Reclaim your personal life while achieving greater professional success. Your time is your life. Period. How you spend it ends up being what your life is. No matter what you want to do, wish you had done, plan to do, or fantasize about while you are doing something else, the final reality of your life is how you spent your time. What can I say? My time management does not seem to be working. Heto na lang -Sana manalo ako sa lotto ngayong gabi. Please please! The hubby and I had a wonderful time clubbing last Friday night! It could just as well be our first time to be in a bar together, drinking and dancing the night away. I'm glad I decided to come with hubby to that fancy birthday party. Really nice way to celebrate. Kudos to the celebrant! It was not just any bar. We were at 7th High in Bonifacio Global City. Bongga! If interested to host your own private party, manila clubbing has more details. The food was yummy, the celebrant showcased his talents, playlist by the DJ was great and best of all, drinks were free. Ang saya-saya! There was also surprise entertainment, when some had a few drinks too many. Reminded me of the younger, carefree days when it felt rightful to go out and drink with friends once in a short while. So two vodka cruiser + 1 tequila shot later, I found myself grinning from ear to ear as hubby and I hit the dance floor. So I am a frustrated blogger! In my mind, I have already blogged a lot, if only I had more time and energy. Kung kinakaya lang sana ng katawang lupa ko ang gising ng 24 oras. Finally, after planning to, starting a new blog, abandoning it, starting another, deleting it, I have decided to settle on my new blog - head over heels. And because I wanted this to work, I spent the last two Saturdays obsessing over the design of my blog. Feeling magaling lang sa design. To come up with my site background, I browsed through my magazine subscriptions for pretty images and edited and edited and edited yet again using paint program until finally I decided to settle on the simpler format that it is now. Naka-15 edits ata ako. I would like to give photo credits for the images I grabbed from Smart Parenting, Oprah, OK and Star magazines. It is a work in progress but I hope I learn more of the technicalities as I go on blogging. Our Friday started early. At midnight, husband and I were putting on the finishing touches to TL#1's costume for today's school celebration of Nutrition Month. He is going to be a milk. It's the closest thing to a nutritious food that we are capable of making. No sewing involved! TL#1 was so excited to put it on and he wouldn't let mommy go to work. He wanted me to come with him to the Costume Parade. Unfortunately, Mommy's committed to meetings at work. I can't wait to hear his stories on the activity later today. Happy Friday. See you weekend. Hooray! I'm trying to figure out exactly why. I do not, by nature, easily get frustrated or mad. I may be frustrated because apparently, I failed to check that TL#1 needs hairnet, gloves and apron for today's activity. I only prepared the ingredients for the graham cake. Epic fail. Lesson learned: Check the diary. Do not depend on the discussion with the assistant teacher. I may be mad because I anticipate a very busy day at work yet I have to remember to email the cake order form for TL#2's birthday and pay the cake. And yes, I am in charge of the word 'MILK' for TL#1's costume for Nutrition Month celebration tomorrow. I have to do all that today. Ilang oras nga ang Thursday? I'll probably get home by midnight. I may be mad because the weather is humid and I am stuck in traffic. Let's celebrate a small success! Our pre-schooler has been going to school for 3 days in a row without much fuss. Hooray! Mommy is able to get up as the alarm goes off (miracle! ), wake TL#1 up and give him a bath. We leave the house at the same time and I see him off to school. Hopefully, I did not blog this 'success' too early and the whole week goes well and the next and the next. It is actually the hubby who is behind the resolution of our issue on TL#1's reluctance to go to school. Our pre-schooler used to throw tantrums and would even hide under the bed. Ang hirap sa umaga. Hubby discussed with our little boy the 'special steps' he has to take every weekday. Then they agree on something to do on the weekends as sort of a reward. Peg nila si Captain Oso. 1. Wake up at 7:00 AM. 3. Take a bath (with mommy). 5. Put on our clothes. Surprised that hubby was free to go home by 8:00 pm but by the time he reached the office to fetch me, it was raining cats and dogs. Ang lakas! So rather than be stuck in traffic, I asked if we could go watch a movie instead. Instant date night! I needed to relax a bit. My head was aching from the number of issues I had to address. I would rather be busy than stressed anytime. But then, issues and queries put me on my toes, make me think beyond the box and force me to stretch a bit, get out of my comfort zone, reach out, consult, learn. Daming sinabi. Haha! I'm trying to look at the positive side. The proper mindset helps me a lot at work. Worrying and being anxious is useless, I know. The moment I have learned to let go (a bit) of my fears of failure and confrontations, the nature of my work became more manageable (on most days, at least). It also helps that i'm trying to focus on the here and now. Mindfulness. That's the goal! Our eldest TL#1 had learned to crack some (corny) jokes from his daddy and he keeps repeating them, even to his daddy's Indian colleagues who don't understand Tagalog. Ano ang tawag sa octopus that goes meow! meow! meow! What do you call a fish that crawls? Anong fish ang pwedeng pambayad? Yesterday, we had an early dinner in the office courtesy of those who got promoted (ahem). We ordered yummy lechon from Elar's. 15 kilos of roasted pig was gone in approximately 30 minutes! Gutom lang? We did not even have the chance to take a picture of the whole lechon. We also had soupy sinigang sa miso and sweet leche flan, thanks to our in-house caterer - ECG. Waahhh! It's 7:30 already, TL #1 is going to be late for school again. I promised him we'd wake up early this week. My alarm went off an hour ago. Internal struggle! Ang hirap gumising ng maaga lalo na at umuulan, malamig ang aircon! Our eldest is sooo like me, he would snooze as long as he can. And he wouldn't go to school if mommy or daddy will not bring him (kahit hanggang sakayan lang). Not so much an issue if I don't get off work at 10 pm most days and have to wake up at least twice at dawn to feed TL #2. I need and deserve my sleep, especially because I have anemia and I don't want my world to go spinning around. Husband is on mid-shift, he also gets to sleep by midnight. There are days that we get home by midnight and our sons are still awake. What the...! But it is a Monday, there's no excuse except that (okay, okay) maybe i love my sleep too much. TL #1 is a mommy's boy -Nooo. I want my mommy! I realized for a while now that I am living head over heels aka in disorderly haste every day, mostly because I'm very busy at work. I hardly have time to be a good housekeeper, wife and mom. I am grateful, therefore, to have the weekends to myself and for my family. I am a wife and a mom to two young kids but most of my hours are spent working, which makes me a hardworking (albeit sometimes reluctant) working girl, aiming for self-fulfillment and financial freedom. I love reading and writing and sleeping (not a morning person - not me)! I have taken up driving lessons but can't find the guts to actually drive. I have a love-hate relationship with commuting. I hate the traffic and the queue and the drivers who hate traffic too. But I love that I get to read and write during commute, my precious ME time during workdays. I am an Ilokana but thrifty is not in my vocabulary, to save and spend wisely are my flitting goals. Apparently, we're going to spend our third night here in the hospital. It's our first staycation for the year, probably our 10th (or more) in the last 3 years. It's a becoming family tradition which we are trying and praying hard to break. This should be the last one. Our youngest is sick - down with persistent cough, fever and diarrhea. Oh, nothing serious really compared to our eldest son's bout with the kawasaki disease, the very reason we tend to border to paranoia when it comes to bringing our kids to the doctor. This past Saturday we lay to rest my neighbor’s father. 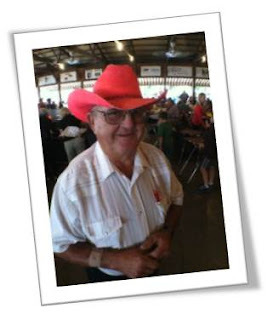 He was a famer, rancher, cowboy, gentleman, and a friend to all. He died doing what he loved doing best, checking on his cows and spraying fences. He was teaching this 50 something city boy professor how to become a farmer and I kind of think he enjoyed seeing an old dog try to learn some new tricks; a desk jockey work a field and get cow sh*t on him.